Is a condition in which the skin pores clogged, causing lumps and abscesses (pockets of pus) are inflamed and infected. Acne most often affects adolescents, but can occur at any age. This condition usually starts at puberty and may continue, for many years. Possible causes are hormonal changes that stimulate the sebaceous glands (oil glands) in the skin. Other hormonal changes can also trigger acne occurs during the menstruation, pregnancy, birth control pills, or stress. Dietary factors have little or no effect at all on acne, though some people think they are sensitive to certain foods. During puberty, the sebaceous glands are more active and produce excess oil and dries, the skin peeled off so that bacteria accumulate in the pores of the skin, and forming blackheads. This blackheads that block the flow of oil from the hair root sheath (follicles) to the pores. If a partial blockage, there will be black nodule, but if the blockage total, there will be white nodule. Bacteria that grow in the pores are clogged, outlining some of the fat in the oil, and cause skin irritation. Black and white nodule is what the acne irritated, and if it gets worse will form an abscess. cucumber tree including the family Oxalidaceae. cucumber tree is one of the hard woody plants. High trees can reach 10-12 meters. Cucumber tree plants suitable in a quite exposed to sunlight and can grow to a height of 500 meters above sea level. Cucumber tree plants has small leaves, face to face, oval shape with the bottom downy, arranged in the petiole, even finned and grow at the ends of branches or twigs. Cucumber tree flower shaped like a star with pink-purple color. While fruit oval of your thumb, and hung in a series of fruit that grows in the trunk or branches. 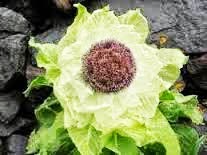 The young fruit is green and the ripe one looked yellowish with a sour taste. 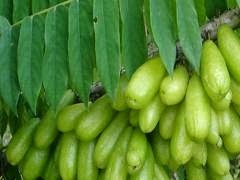 Cucumber Tree Fruit : saponins, tannins, glukoside, calcium oxalate, sulfur, formic acid, peroxide and potassium citrate. The trunk contains: saponins, tannins, glukoside, calcium oxalate, sulfur, and formic acid. The leaves contain: tannins, sulfur, formic acid and perokside. How to make: 3 pieces of cucumber tree, shredded, Add salt to taste, stir well. Use as a powder to rub on the face. How to make: 6 star fruit and 1/2 teaspoon of sulfur powder finely ground. Squeeze together with 2 tablespoons of lime juice. Rub on facial acne (3x daily).